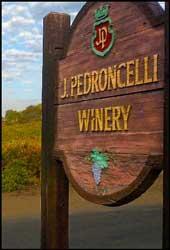 Since 1927, when John Pedroncelli, Sr. purchased vineyard and a small winery in Sonoma County's Dry Creek Valley, two elements remain unchanged: the exceptional place the Pedroncelli family farms vineyards, and the family's dedication to making fine wines. Rich aromas of red plum, sage and toasted oak introduce our Cabernet Sauvignon. Ripe cherry fruit, black olive and black pepper spice follow on the palate. The wine showcases the fruit with a bit of jammy blackberry and a spicy finish. From a richer vintage showing firm tannins and good acidity. Wine Spectator 89" A zesty red, with a lively balance and appealing notes of dried cherry, sweet anise and pepper. Drink now thru 2026. " Wine Enthusiast 89" Juicy in red plum and layered in subtle suggestions of herb and cinnamon spice, this will please a wide range of palates and pocketbooks, the wine given a year in American oak. It’s a good one for the dinner table or larger gathering. " " Aromatic with a bouquet of passion fruit, peach, and grassy notes. The fresh flavors are layered with lemongrass, green apple, and honey. Our Sauvignon Blanc is tart-sweet and quite refreshing with well-integrated acidity. Please enjoy upon release or within a year or two as no aging is required.